Decks are optional, storyline based, suggested templates of complementing abilities. 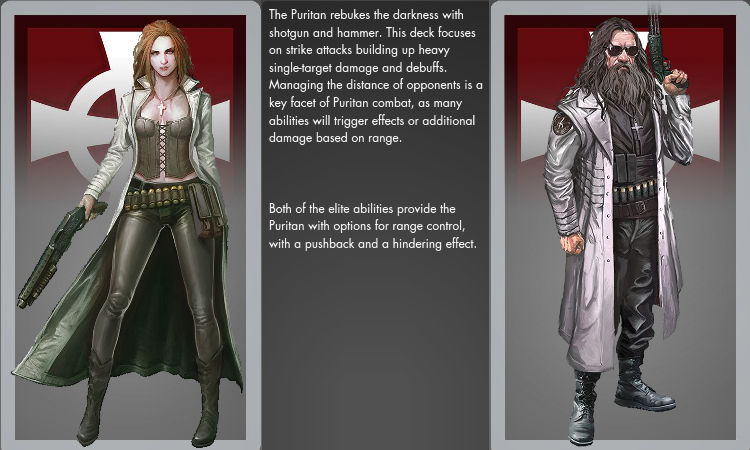 There are eleven unique decks for each faction, representing the various specializations they have taken up to combat darkness—and each other. 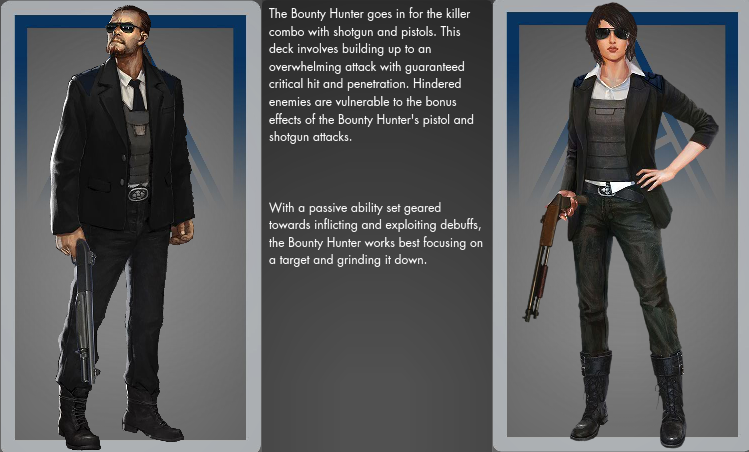 Choose a deck from the menu above to see its description, weapon requirements, the Seven Passive and Active Abilities and a description of what the deck philosophy is, along with pro's and cons. 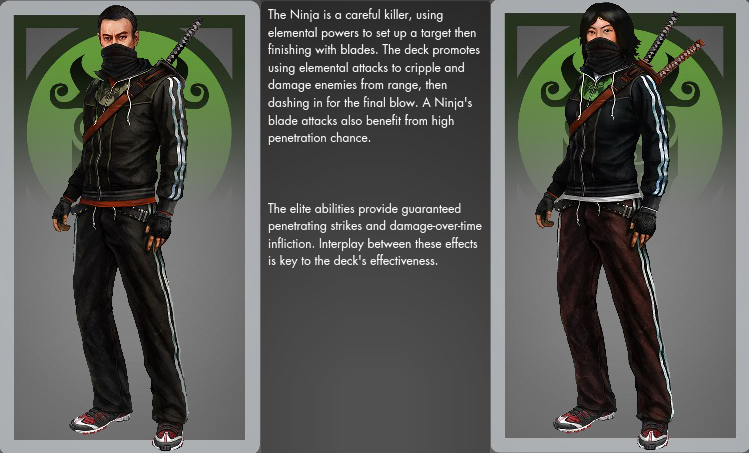 In addition to the benefits of a deck’s ability synergies, completing a deck will earn the uniform pictured.. This is a Tanks Tank deck designed to ensure that no one in the party gets aggro besides the tank. It capitalizes on Weakened targets helping with avoidance and damage reduction. Support to the group with a Barrier to place on party member and self healing through the use of Escalation. Deck is designed to keep HoT's rolling and AoE splash heals to keep everyone topped off whether they need it or not. Pros: Every Ability supports Healing. Cons: The one Single Target heal may not be enough in a Burst Damage situation. Afflicted was not take advantage of to increase output, look for it from a group mate. 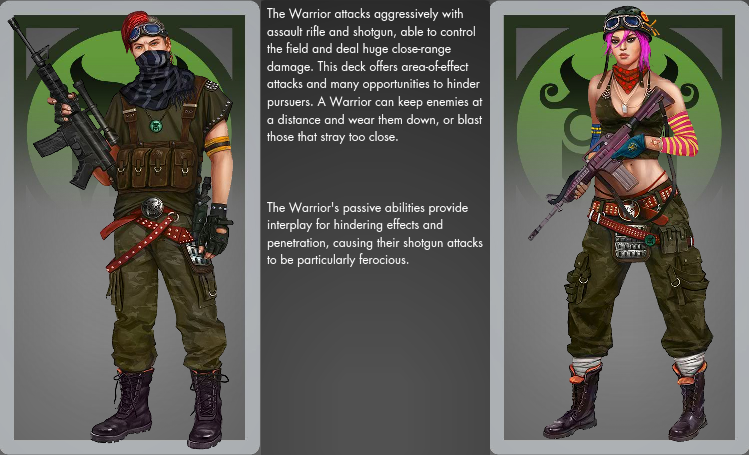 The Warrior is a ranged specialist using the Assault Rifle and Shotgun to bring down her enemies. 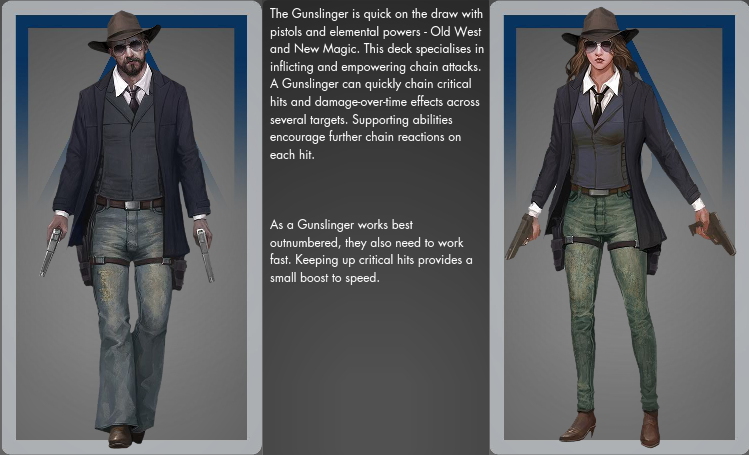 She can do a lot of damage to both single targets and groups of monsters with Penetrating hits and Afflict them with damage-over-time effects, but her main tactic is to constantly Hinder and slow down those who stand against her, so she can shoot them from a distance. 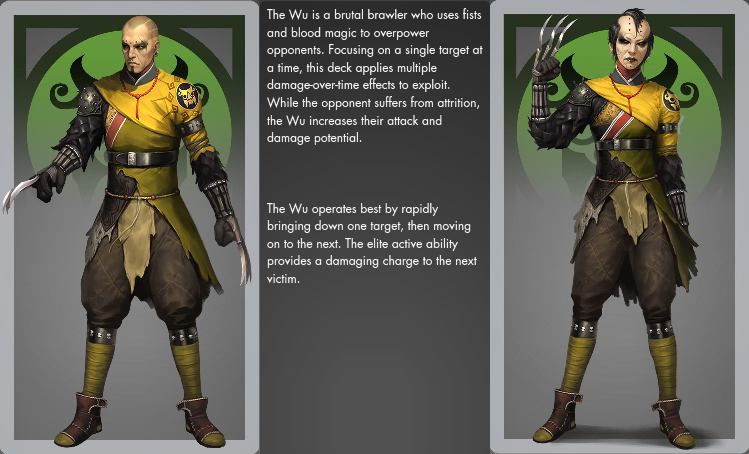 The Deck is very good for solo play, as it can control its environment and leap out of danger if enemies come close, but the Warrior must be very careful when facing opponents which are resistant to being Hindered. The Warrior can be very useful in player-versus-player battles, where slowing down opponents often can be the key to victory. 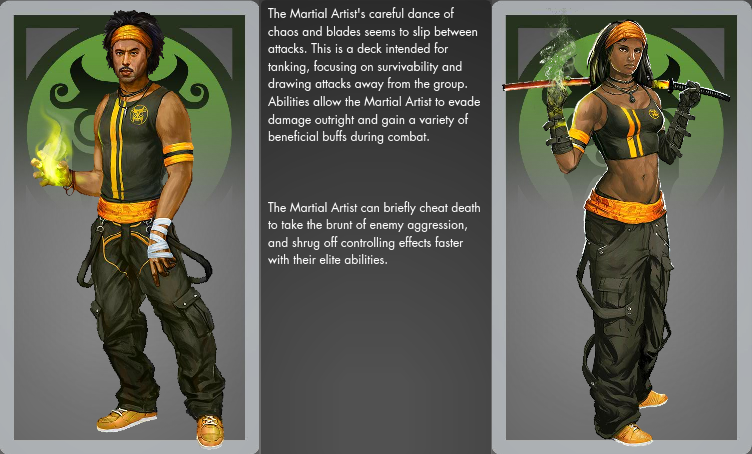 Designed around Hindered to control movement to allow greater concentration of the numerous damage abilities. Cons: Heavily dependent on position to maximize damage. Deck designed to control movement through triggers from the Hindered State. Cons: To be effective, you need to be in the thick of things. Basis is to apply Afflicted to get the Penetration Buff to increase damage. Pros: Consistent damage from DoT abilities. Supports moving around. 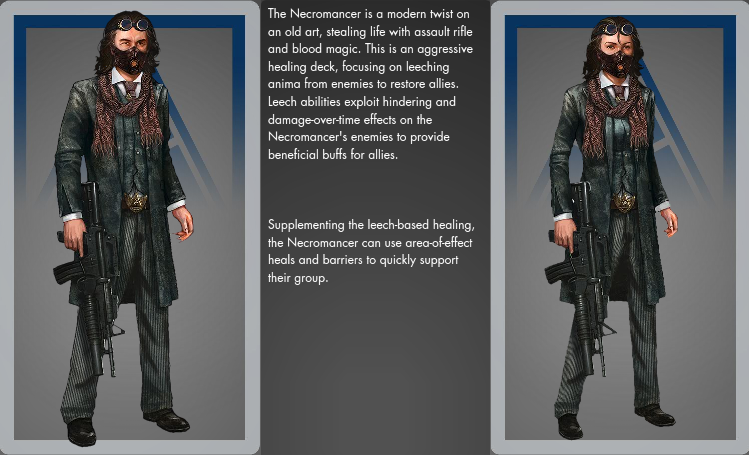 The Neoshaman utilizes both Blood Magic and Chaos Magic to painfully extinguish the life of his opponents. 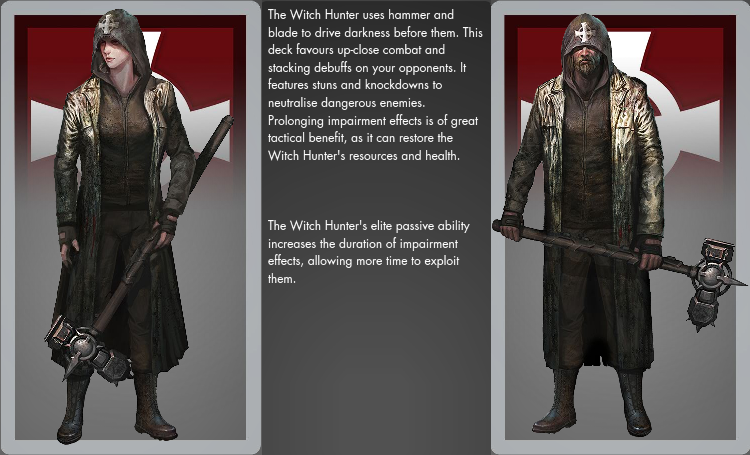 He excels at doing a lot of damage to single targets, with strong Focus attacks and a host of damage-over-time effects. 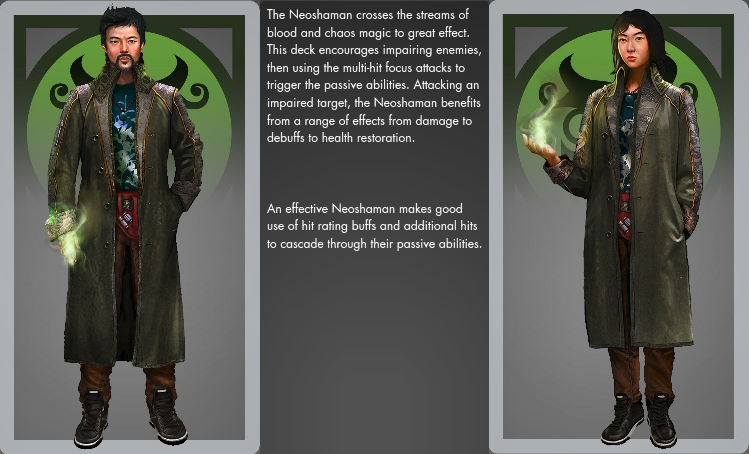 The Neoshaman’s ability to impair enemies, and draw the life force from them to replenish his own, increases his survivability. The Neoshaman Deck is versatile and works well both for playing alone and in groups. Being able to impair enemies makes the Deck a good choice for player-versus-player combat, and the ability to do a lot of damage-over-time to a single target makes it very useful against powerful dungeon bosses. The Warlord wreaks utter devastation on the battlefield. He is a master at knocking down and stunning his enemies with brutal Hammer blows and cunning Chaos Magic. With the ability to constantly Weaken and Impair those who stand against him, those who face the Warlord is in for an exercise in utter frustration. The Deck is very good for solo play, as it can Impair its enemies and deal increased damage to them while they are helpless. 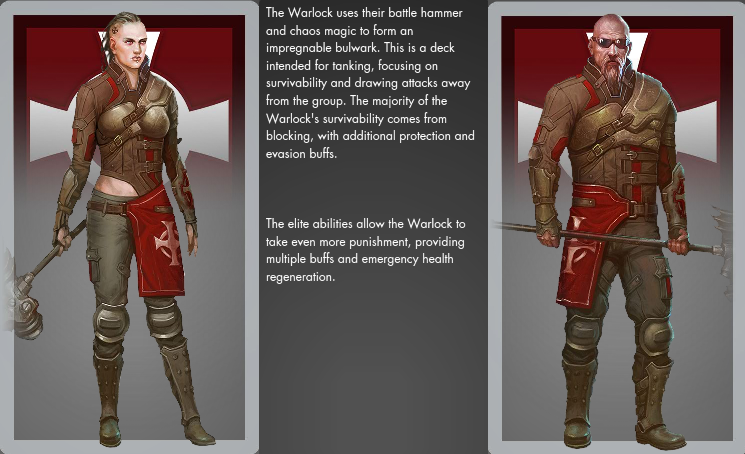 The Warlord can also tackle groups of enemies, but needs to kill them off quickly as the Deck lacks defences. However the Warlord needs to be very watchful against those who are resistant to being Impaired. 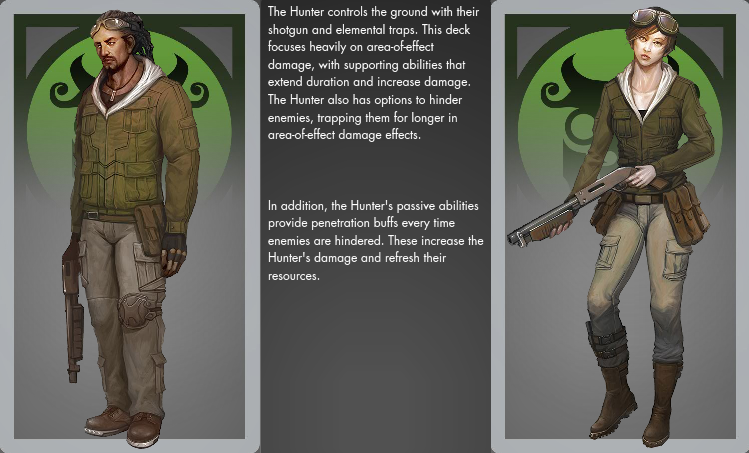 The premise of the deck is to apply Impaired and Weakened on the targets through both AoE and single Target abilities. This results in amplifying damage dealt by the other abilities and assisting the party’s damage by putting Exposed on the targets, which increase damage by 3% per stack. And with Pulling the Strings adding Precise to ensure you don’t glance, there is very good synergy to have Impaired and Weakened always up on your targets. 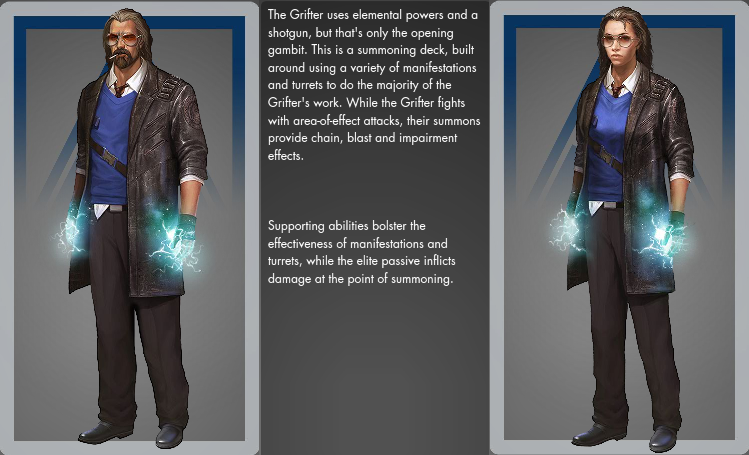 Without hate generating abilities beyond the High Damage output, control in maintained via the AoE knockdown abilities. Every 15 seconds you can dash through a group of mobs knocking them into the air and Epicentre can keep up to 5 mobs on the ground for 2.5 seconds. As there are a number of Mobs and Bosses that ignore Hate Mechanics, this a perfect tank for those scenarios. 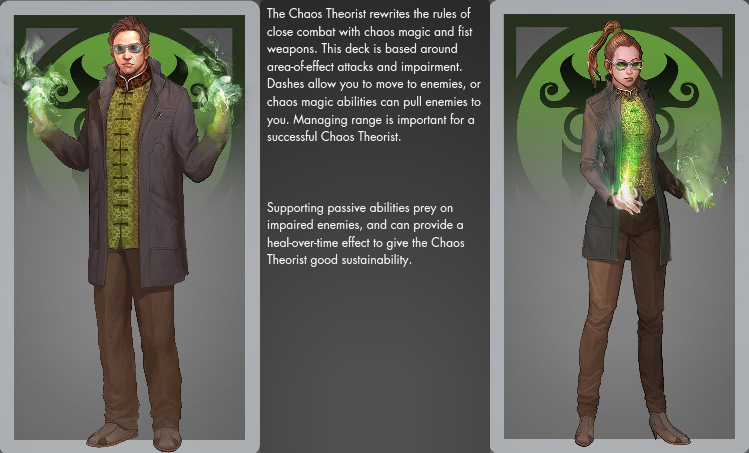 The Chaos Theorist is a whirlwind of attacks, hitting anyone around him. 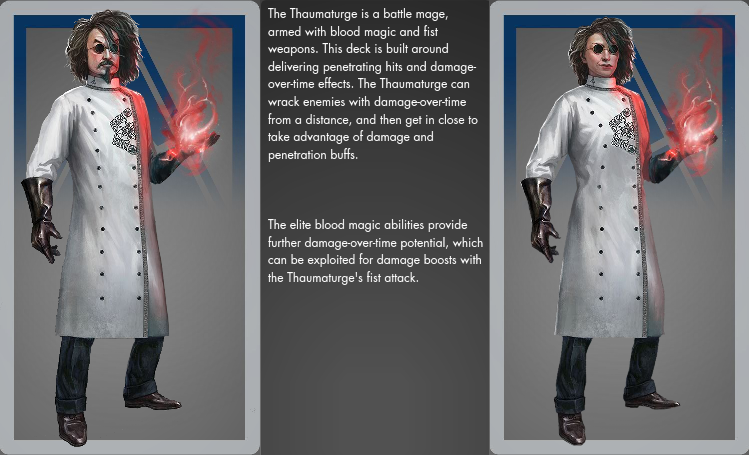 He uses both Chaos Magic and Fist Weapons to damage large groups of opponents. The Chaos Theorist is also very mobile and able to control the positioning of his enemies, by Impairing and pulling them towards him, so he can ensure he hits all of them at once. The Deck is especially good for solo play against groups of monsters. It can Impair enemies and hit them with augmented Frenzy attacks, which give buffs and heals. The Chaos Theorist Deck can be very good in player-versus-player combat, because it can control the battlefield, render opponents helpless and unable to flee to safety. Heavy AoE centic deck that creates Heals for the team and self. Cons: Need to be in the center of things to capitalize of Mob Pulling abilities. 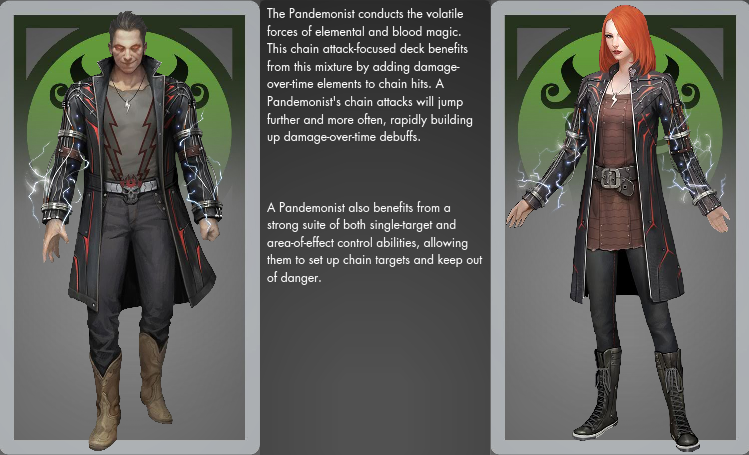 The Pandemonist combines the forces of Elementalism with Blood Magic to be a raging torrent of magical power on the battlefield. She is excellent at crowd control, being able to Impair and Hinder large groups of enemies with roots and stuns. She can keep a safe distance from her rooted foes and let loose with wicked Chain attacks which not only hit them all, but also do brutal critical hits and Afflict them with punishing damage-over-time effects. The Pandemonist Deck is good for fighting against groups of monsters both alone and in a team. It is however always crucial for the Pandemonist to be able to keep a distance from her foes, because of her lack of defenses. In player versus player combat The Pandemonist can be excellent at trapping enemy players with nasty roots, so her teammates can fall on them like a pack of hungry wolves. This deck picks summoning abilities from the Elementalism tree as well as a turret from shotgun. 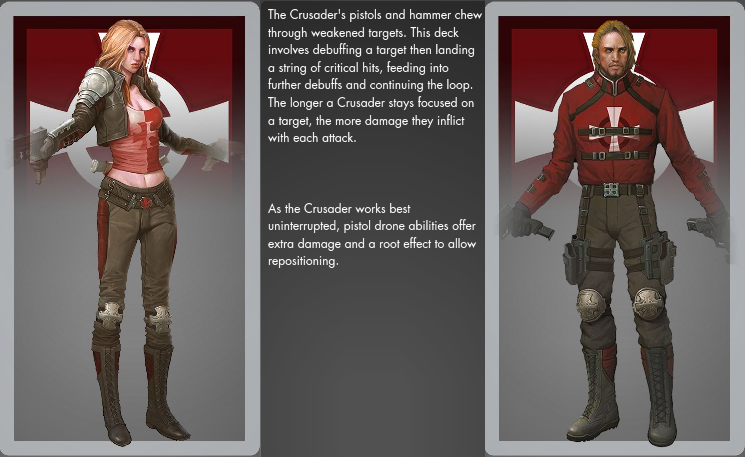 As such it excels at controlling space on the battlefield by AoE damage and application of the Hindered State. The Goon is made to last. 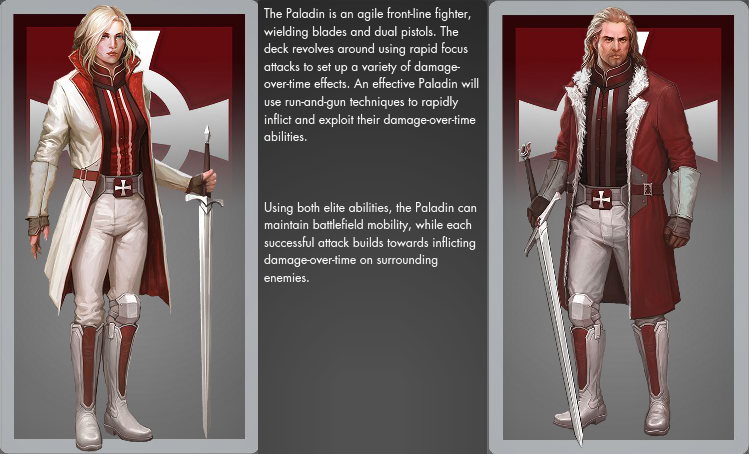 She uses the powers found within Blades and Hammers to become a formidable defensive master. 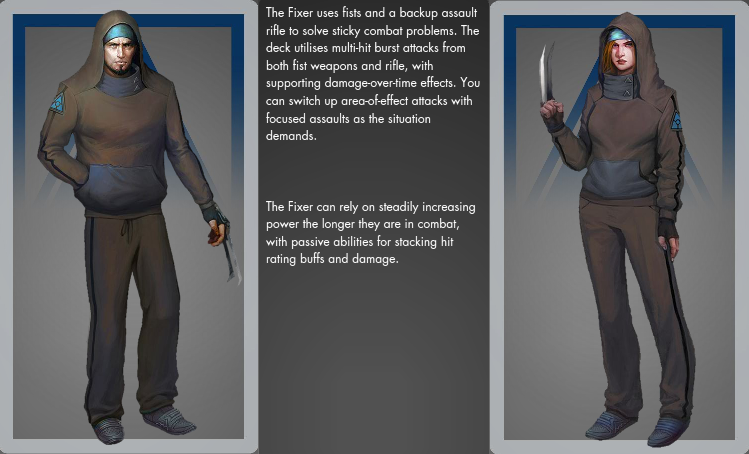 The Goon is highly survivable, with a strong defence and a wide array of tools to replenish her health, even against large groups of opponents. The Deck is first and foremost made for Tanking, and therefore functions best in a group. 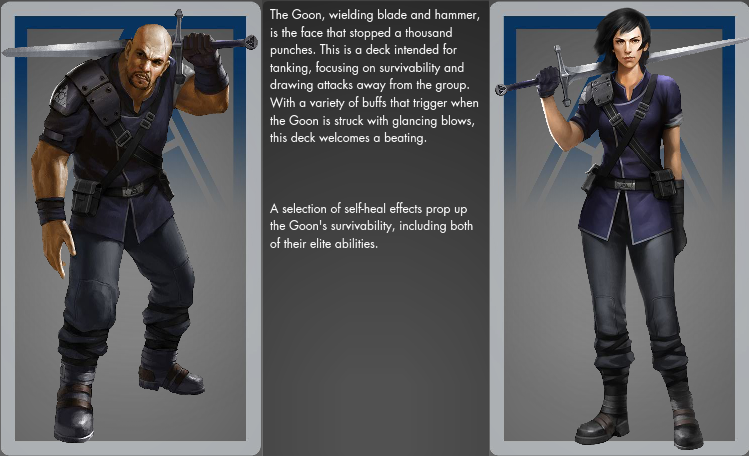 The Goon has good damage mitigation, self healing powers, and effective abilities for getting the attention of enemies. The Deck is especially suited for tanking large groups of monsters at once, because it can constantly build both Hate and apply damage-over-time effects to many opponents at the same time. The Goon deck tanks with several hate generation abilities and a healthy dose of self-healing. This deck is most effective against Afflicted enemies, but it has only one passive that causes Affliction. Grouping with affliction based decks would make it much stronger. Pros: Two melee weapons means a great deal of damage up front. Good self healing. AoE Hate generators. Cons: Slightly team dependent. Does not have much Direct mitigation as other tanks, not very effective against bosses. 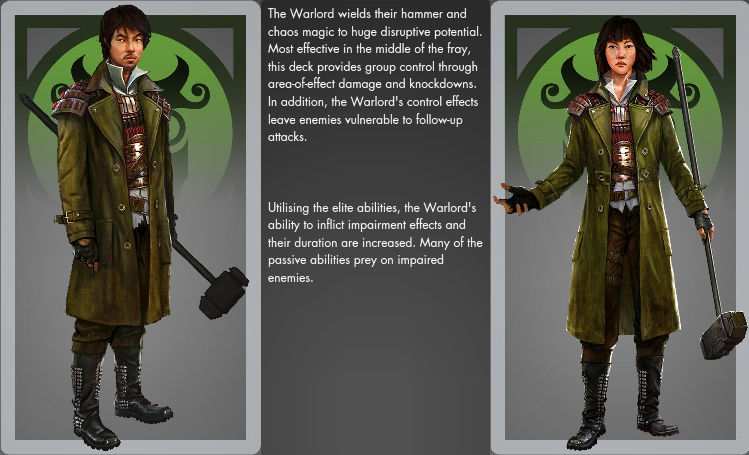 The Illusionist focuses on Chaos Magic to hunt down and trap his opponents, and backs his magic up with stunning Hammer blows. He is a master at Weakening foes and finishing them off quickly. 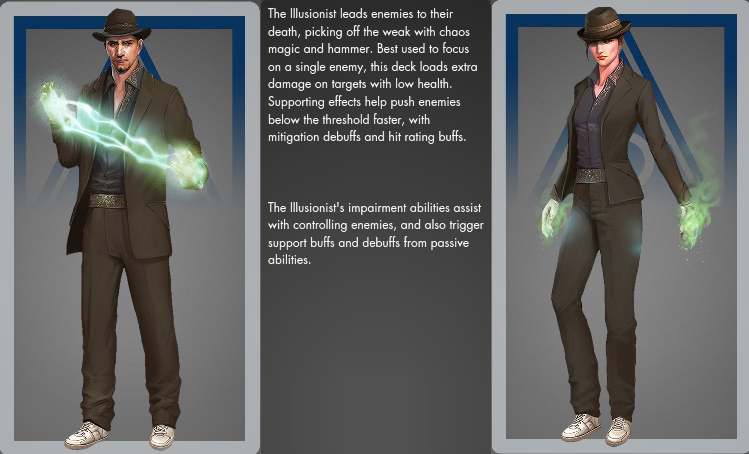 The Illusionist excels at doing high damage to a single target. He can avoid damage by being maneuverable and by impairing his enemies, but must defeat them rapidly as he lacks defensive abilities and the staying power for a long fight. The Illusionist Deck is good for solo play, but especially suited for dungeon groups. The ability to constantly weaken enemies and deal high amounts of damage to monsters nearing death can be invaluable against powerful bosses, who often use their most potent attacks at the end of their lives. The Necromancer takes direct control over the forces of life and death. 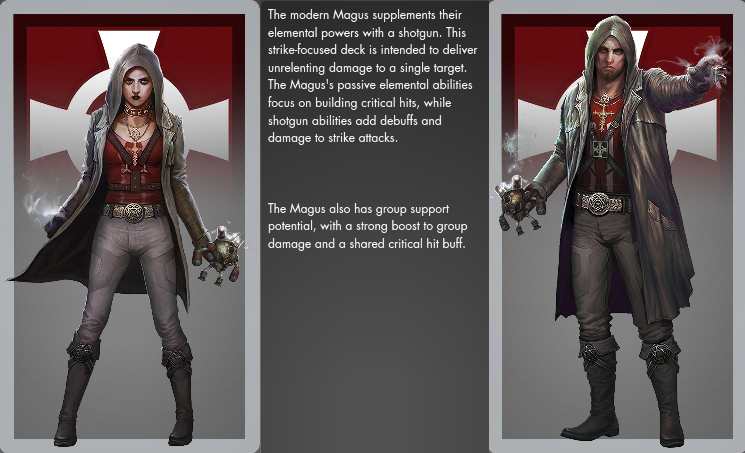 She combines the wondrous powers found in Blood Magic with the Assault Rifle to heal her companions and keep them safe. 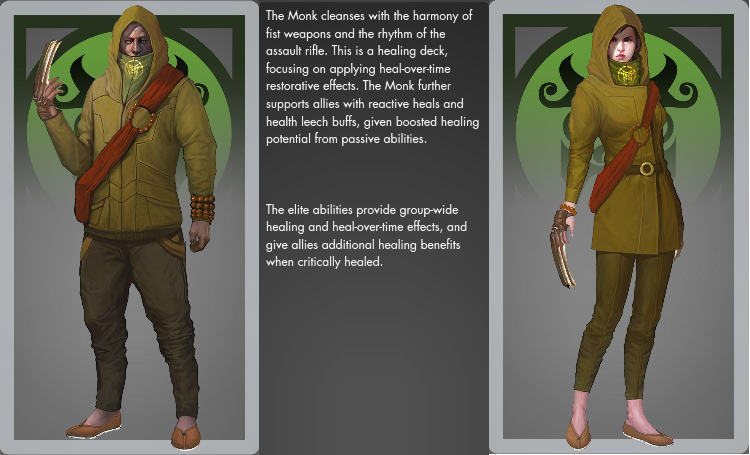 She can replenish life directly, put up defensive barriers or give teammates handy Leech effects which return some of the damage they do as healing. The Deck is focused on healing and therefore tailor made for team play, as it can do little damage on its own. The Necromancer is very handy for groups who want to tackle difficult challenges like Lairs or Dungeons. The Deck does not specialize on healing one target quickly, but instead on healing and protecting the whole team continuously. 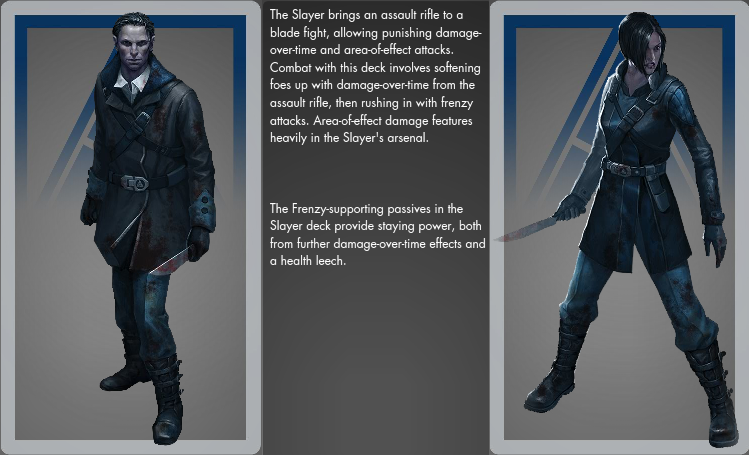 The Slayer is an all-out damage specialist. She uses both Blades and the Assault Rifle to deal devastating Penetrating hits and brutal damage-over-time effects. Letting loose punishing Frenzy attacks the Slayer can handle large groups of monsters at a time, showering them with damage. The Deck is good for both group and solo play. It lacks mobility and defences, but through raw damage output the Slayer can still come out on top in most situations. With the ability to constantly do Penetrating hits and damage-over-time effects the Deck can be very useful against strong monsters which take a long time to kill and require a team effort. The Bodyguard is a both an offensive powerhouse and a defensive tower of strength. 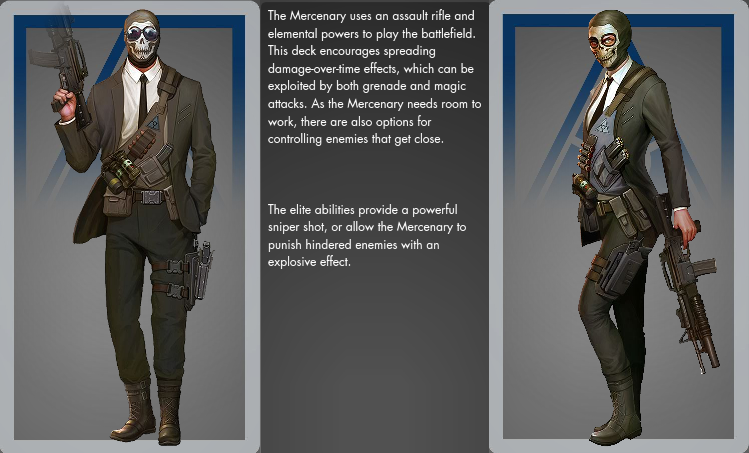 He wields Hammers and Shotguns to handle large groups of enemies at a time. While wading through swarms of monsters his great ability to weaken enemies and Block incoming attacks keeps him safe, and he wreaks havoc among his foes with strong Blast attacks. 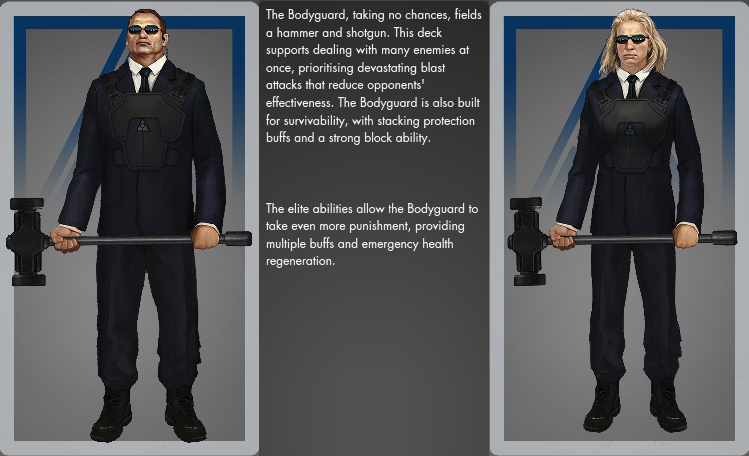 The Bodyguard Deck offers good survivability and great area damage. It is a good choice if you plan on fighting alone against groups of monsters. The Bodyguard can also do very well in player versus player combat. Being able to leap quickly onto groups of other players, hitting all of them at once while staying alive with strong defenses, is a good strategy for a frontline fighter. The Magus fits the term Full Spectrum Dominance like a glove. She is both maneuverable and able to dish out high amounts of damage with punishing critical hits. She can trap and Hinder groups of opponents and increase her entire team’s damage output through clever buffs. 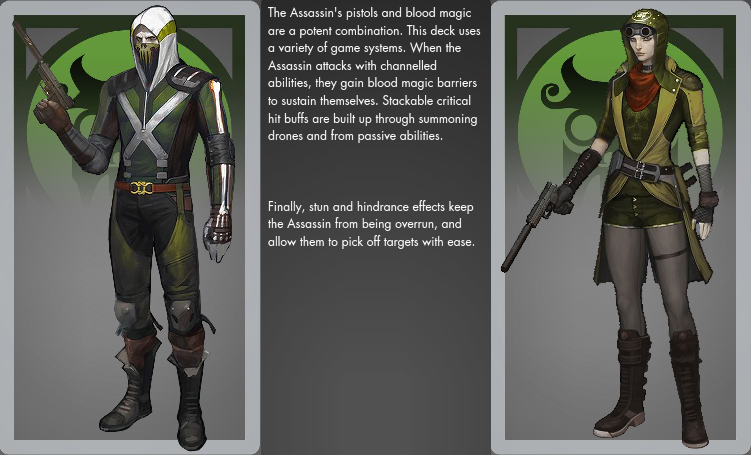 The Deck uses both Elementalism and the Shotgun, and it can deal with almost any situation. It is good for solo play, where it has access to both strong crowd control and high damage abilities, but the deck is also excellent for team play, especially in all out damage races against powerful bosses. The Exorcist uses both Blood Magic and Fist Weapons, but purely for healing purposes. He can not only rescue those in danger with powerful healing spells, but can also sacrifice some of his own health to heal his entire team at once. Everyone will breathe easier with an Exorcist at their side, because he can continuously give himself and his allies protective barriers and heal-over-time effects. The Deck is excellent for team play, as it is purely made for healing. 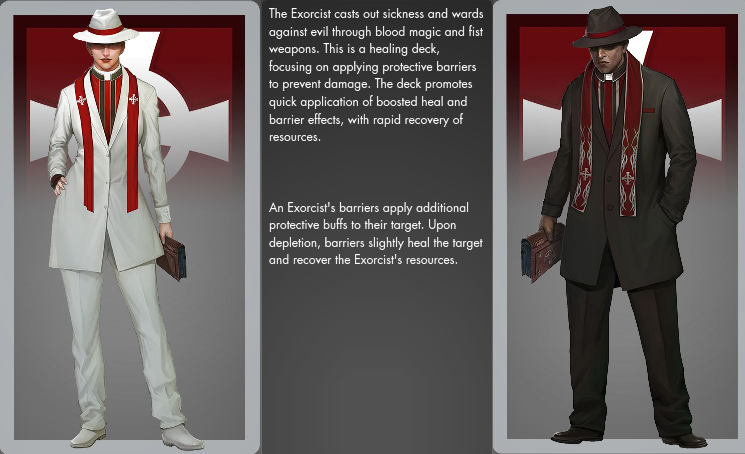 The Exorcist can do no damage on its own, but has strong protective and healing abilities which benefit the entire team. The Deck is very good when facing strong opponents, such as dungeon bosses, because it has good powers for healing both single targets and groups of allies. Utilizing burst attacks which stack dmg procs on the offensive target (prey on weak, one-two, and four horsemen), as well as utilizing dash moves to be mobile and quickly swap between targets (bushwack, helter skelter, chaotic pull). This build also has some crowd control with impaired attacks (knockback from passive ability, bushwack, chaotic pull, and see red). This build generates weapon skills quickly so don't worry if you have to swap target! See red roots the target and works great to stop that mob chasing your healer. I sometimes swap it out with "go for the throat" to add another impair skill. Like the description says, +hit items are very useful to avoid glancing blows. all procs rely on normal hits, so I've been focusing on +hit and penetration glyphs. Pros: high damage, great mobility, and crowd control. cons: no ranged attack, or AoE damage. The Soldier is a huge force multiplier on the battlefield. With all guns blazing he hits his enemies with a hail of bullets from his Pistols and Assault Rifle. His main tactic is to constantly Hinder his opponents and shoot them from a distance. If the Soldier is not pinned down, but allowed to keep shooting, slowing down enemies and constantly manoeuver out of harm’s way, he is a nightmare to face in any scenario. 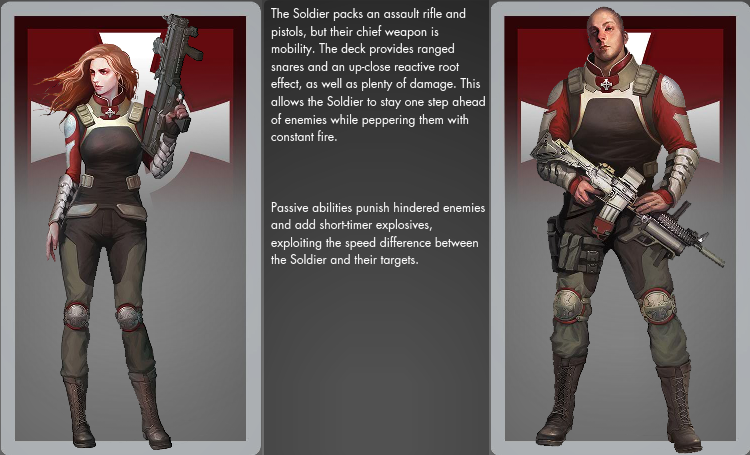 The Deck is very good for solo play, because the Soldier can avoid most damage heading his way by staying out of range of his enemies with high manoeuvrability and Hindering prowess. Some opponents however are very resistant to Hindering effects and against these the Deck needs either allies or to come up with completely new strategies. 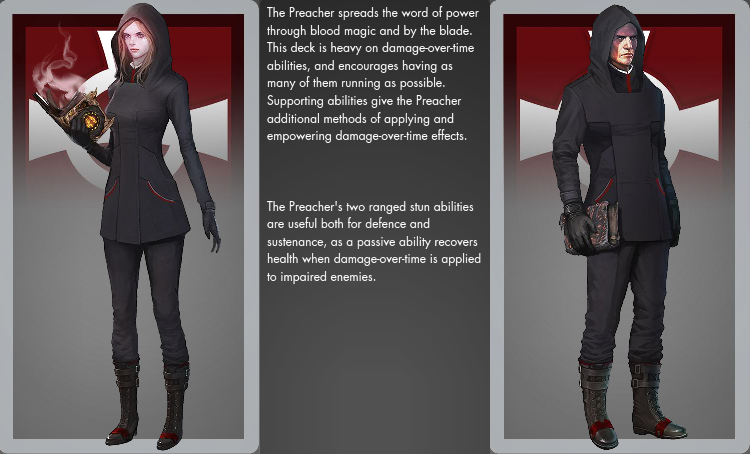 The Preacher uses both Blood Magic and Blades to specialize on cruel damage-over-time effects. There is no escape from the torrent of pain heading your way when you face the Preacher. He will Impair and Afflict his enemies over and over again, draining their life force away second by second. The Deck is good for both group and solo play, focusing on hitting a single target with constantly renewing damage-over-time effects. This strategy can be very effective against strong bosses, which have a wide array of tricks to keep attackers at bay for periods of time. The ability to Impair enemies is also very handy in player-versus-player combat, and seeing opponents die from damage-over-time effects as they try and run to safety never gets old. The Gladiator wades into battle using both Chaos Magic and the Assault Rifle. With a host of Frenzy attacks she can damage large groups of enemies at once, and control the battlefield by Hindering, Impairing and Weakening those who stand against her. 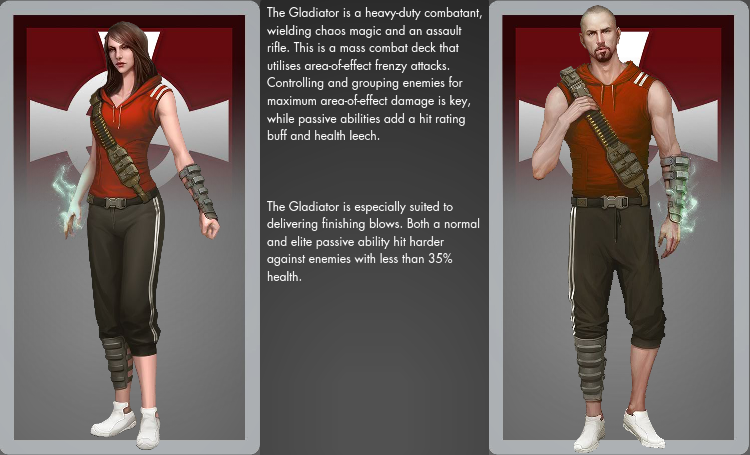 The Gladiator lacks defensive abilities, but can use her maneuverability to stay one step ahead of her opponents. The Deck is suited for both solo and group play when tackling several monsters at once. 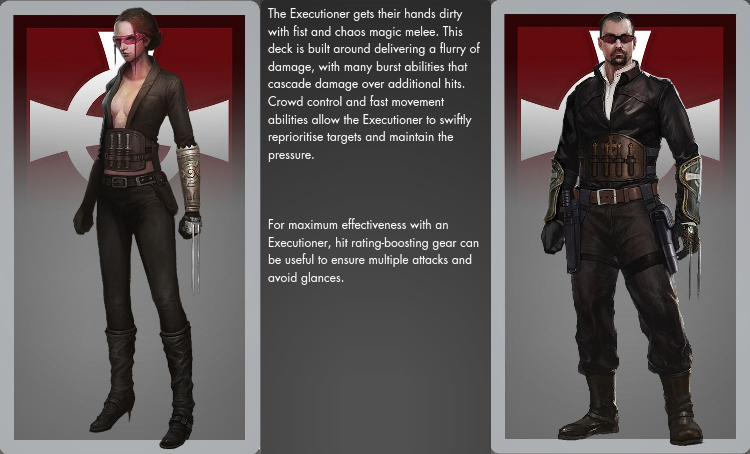 However the Gladiator will find the most use for her abilities in player-versus-player combat. Slowing down and Hindering groups of enemy players, so that allies can jump in and slaughter them, can be an invaluable talent in the battle between The Secret Societies.